Through its Community Canopy program, the City of Sarasota once again is offering free trees to residents to help expand Sarasota’s urban canopy and reduce energy bills, the city has announced. As of Oct. 1, city residents may reserve one tree per household by visiting ArborDay.org/Sarasota, a news release explains. Residents are encouraged to register early while supplies last. Two Florida-friendly, regionally sourced species are available, the release continues: Dahoon holly and red maple. 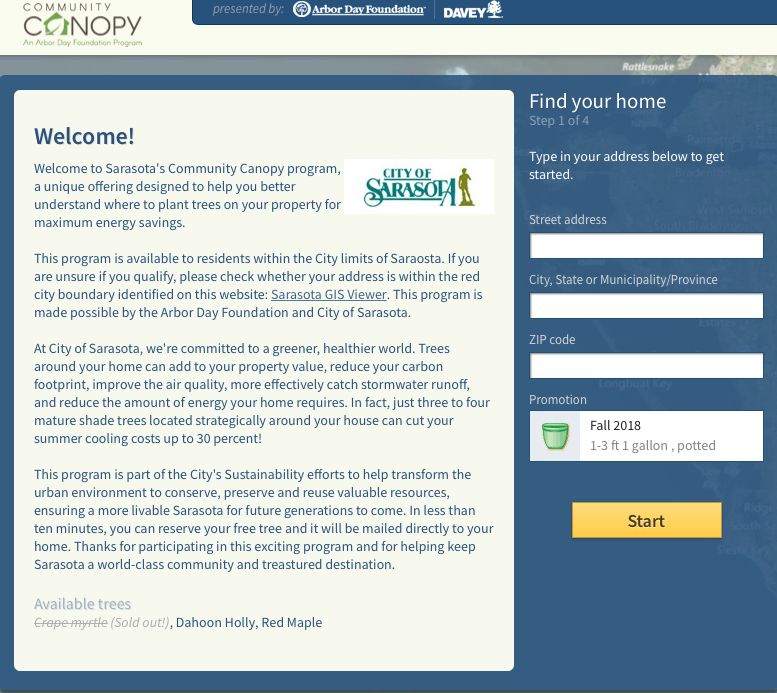 Residents can use a “calculator tool” on ArborDay.org/Sarasota to estimate the annual energy savings as a result of planting a tree in the most strategic location on their property, the release adds. Participants are expected to care for the tree and plant it in the location chosen by means of the online tool, the release says. “A 1-gallon tree will be delivered directly to the resident’s home,” the release notes. This is the fourth Community Canopy tree giveaway for the City of Sarasota, the release points out. “More than 459 trees have been given away, bolstering the urban canopy and helping with climate mitigation and adaptation efforts,” the release says. The program is also supportive of the city’s Ready for 100 initiative, which focuses on energy efficiency and renewable energy community-wide, the release adds. It has been estimated that the trees given away so far will absorb more than 7,500 pounds of air pollutants and filter more than 22 million gallons of stormwater when they are mature, the release notes. Additionally, participating residents will have saved more than 850,000 kilowatt hours of energy “by planting the right trees in the right places to shade their homes,” the release says. “It all adds up to more than $200,000 in combined energy and community benefits,” the release points out. The financial support for the program comes from the city’s tree replacement fund, in which a portion of each payment for a tree removal permit is deposited for use in urban canopy protection programs, the release explains.